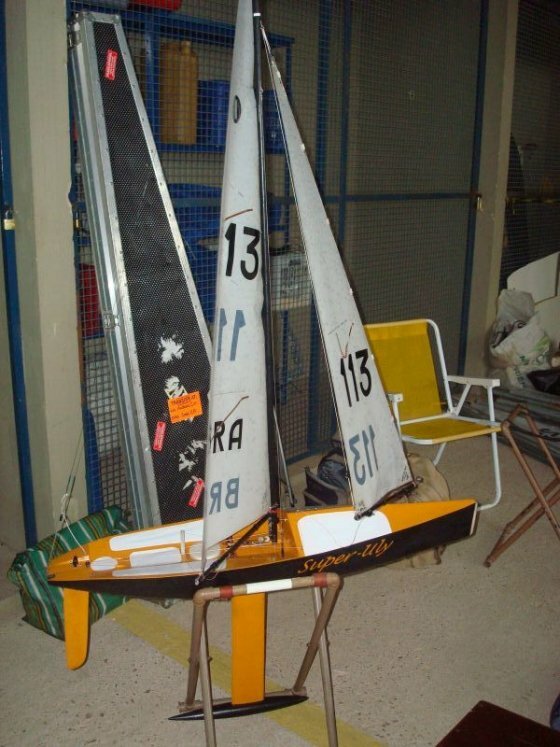 Boat that has currently been used in competitions of the one design ULY 1M class. Built by Os Piratas Modelismo. It was purchased to replace the Super-Uly (BRA 113) in the IOM races. 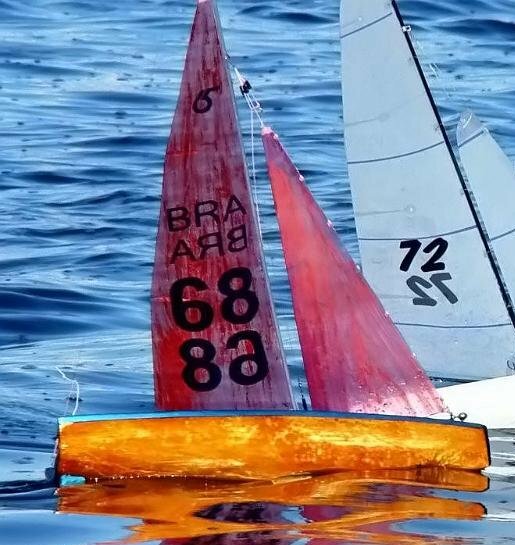 The Topiko is a highly competitive boat, designed by Graham Bantock, and my boat was built in Croatia by Robert Grubisa, getting 3rd place in the 2008 IOM European Championship, sailed by a very good Croatian skipper. In my hands it was placed 4th in it's first national level competition (6th IOM Brazilian Championship, in 2011). 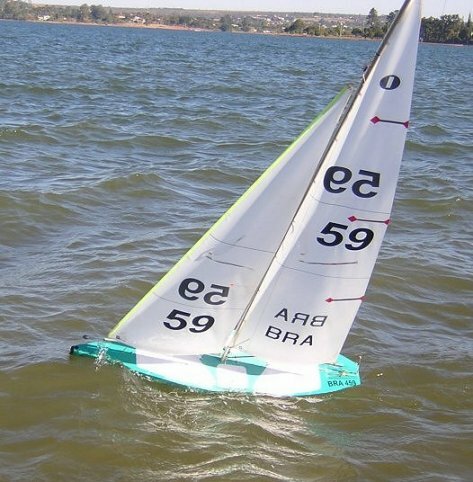 BRA 113 was my first ULY 1M sailboat, manufactured in 1993 and bought by me in 2004. 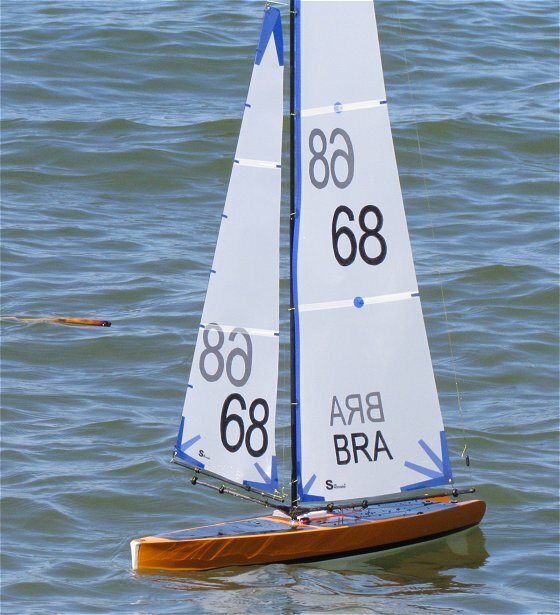 Following the purchase of my current ULY 1M (BRA 459), and considering the definitive implantation of the IOM class in Brazil, I decided to optimize BRA 113, seeking to improve its performance in order to make it more competitive when racing against modern IOM designs, and renamed it Super-Uly. 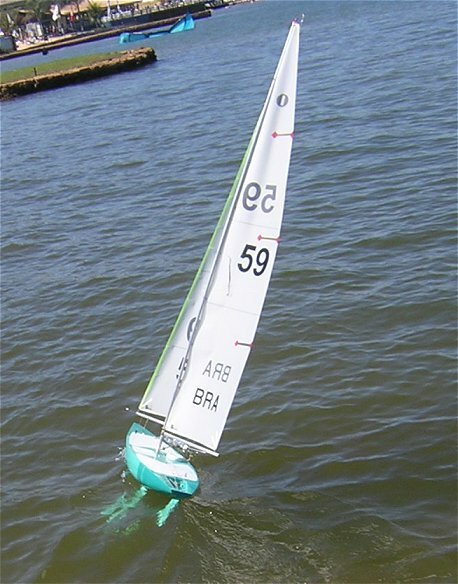 The changes involved the construction of a new skiff stile deck (allowing mast rake adjustments); the change of the keel for a new one, made from carbon fiber and having a thinner profile; the change of the bulb for a longer and more hydrodynamic one; the change of the rudder for a carbon fiber and deeper one; the redistribution of weight by repositioning the battery and servos; and the acquisition of a new set of Blackmagic paneled sails. 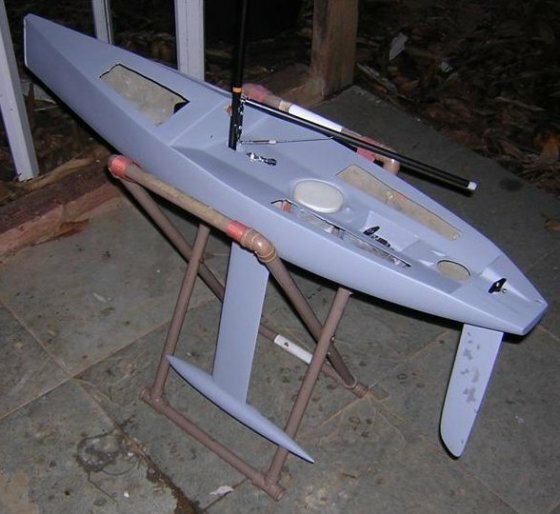 The original ULY 1M configuration. New deck, keel and rudder configuration. Still needing the final painting. 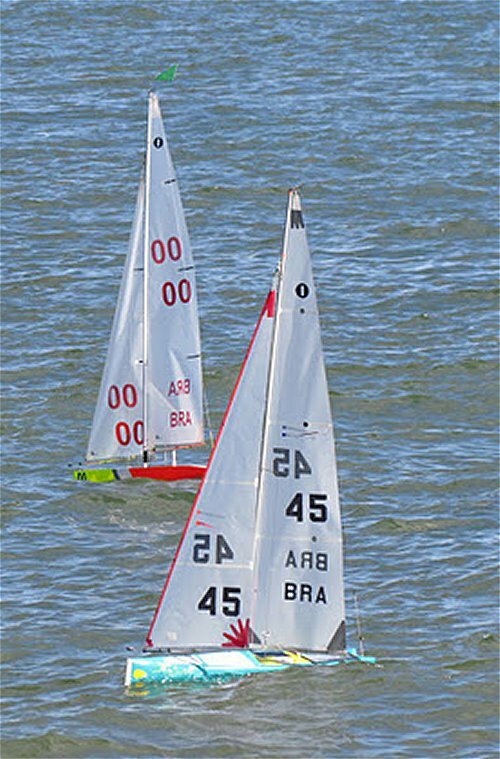 Ready and competing in the 4th IOM Brazilian Cahmpionship, in 2009. It was purchased to replace the RG65 Guaíba. 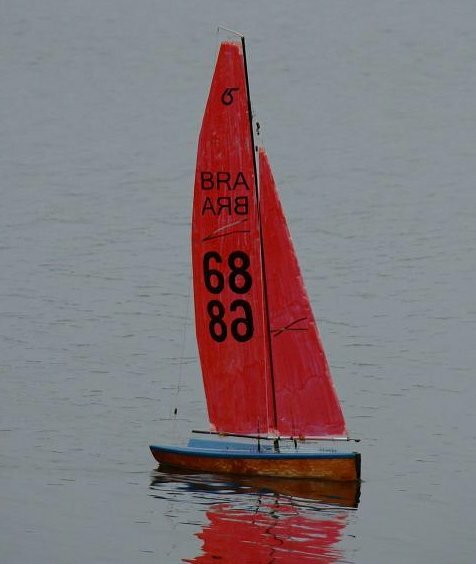 The Rogue is a design from Graham Bantock and my boat was built in fiberglass by Eduardo Rezende (Estaleiro Rio). 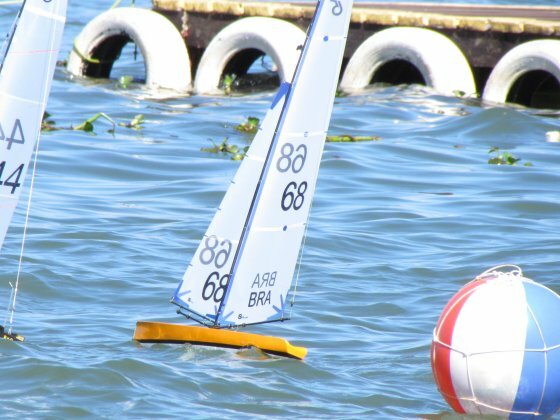 In the 4th RG65 Brazilian Championship, in 2011. 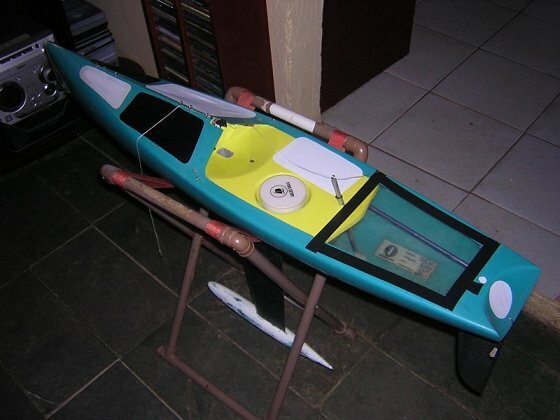 Designed by the naval engineer José Antônio Moni, from Moni Yacht Design, and modified by me. The changes in the original design were the reduction of the width and the installation of a conventional rig instead of the swing rig. 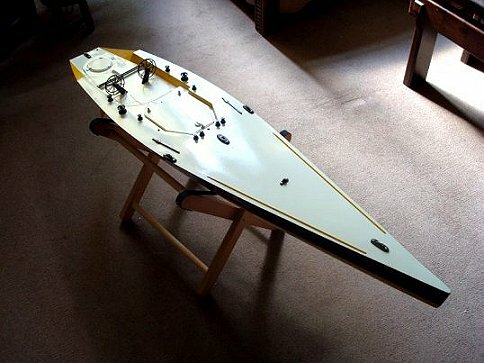 Totally built from balsa wood, hardened and waterproofed with dope. For details of the construction, click here. 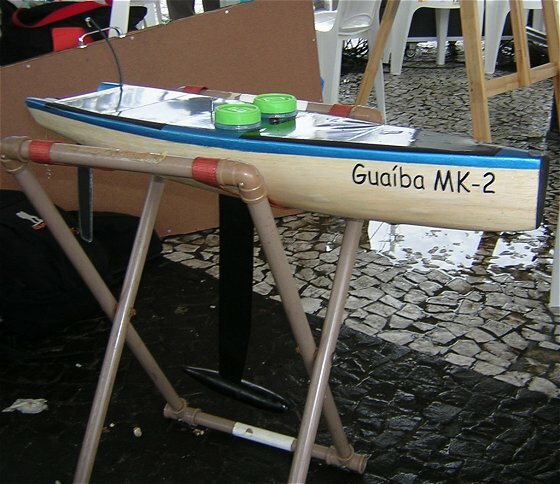 After a modest result in the 2° RG 65 Brazilian Championship, in 2009, the boat was submitted to a complete refit and suffered modifications seeking the 2010 Brazilian championship, being renamed Guaíba MK2. The conventional rig was not handy (especially during rig changes) and was substituted by a swing mast. New sails were ordered from Seamaster. The hull was totally sanded for removal of the varnish and the wood was waterproofed again, this time using only dope. The keel box was moved 6 cm aft and two new keels with different weights were made. 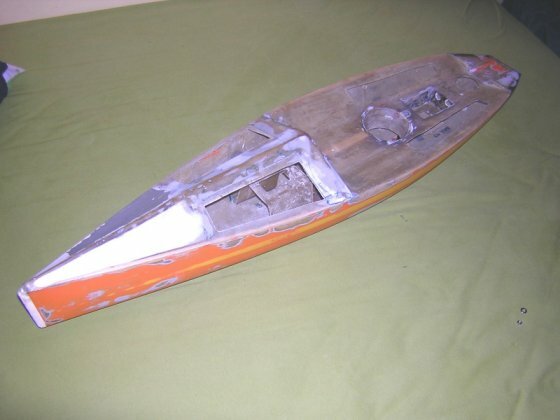 In order to facilitate the handling of the receiver and battery, a plastic pot was installed and the skiff stile deck was flattened. This last modification seeks, mainly, weight reduction. 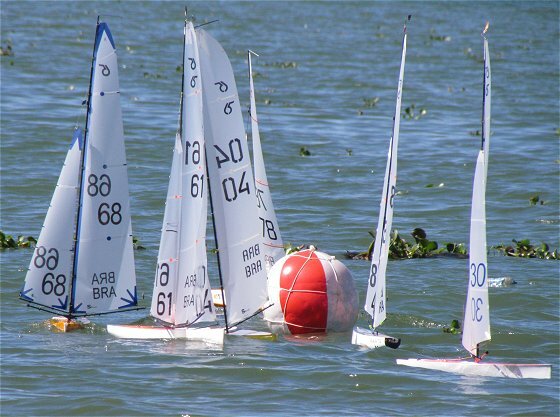 In the 2nd RG65 Brazilian Championship, in 2009. 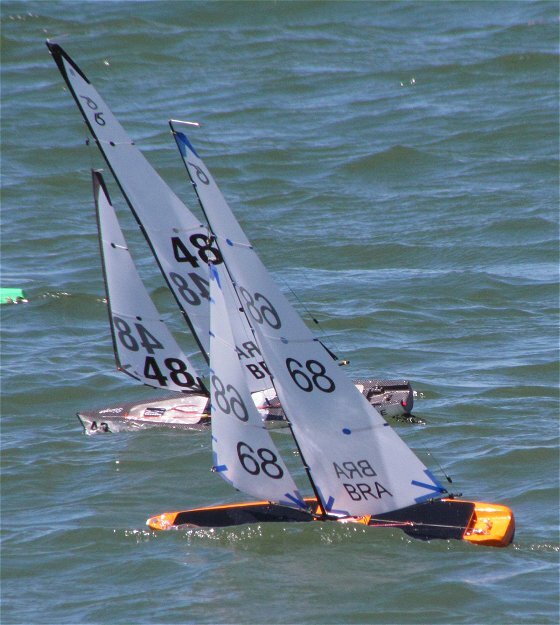 After the modifications, in the 3rd RG65 Brazilian Championship, in 2010. 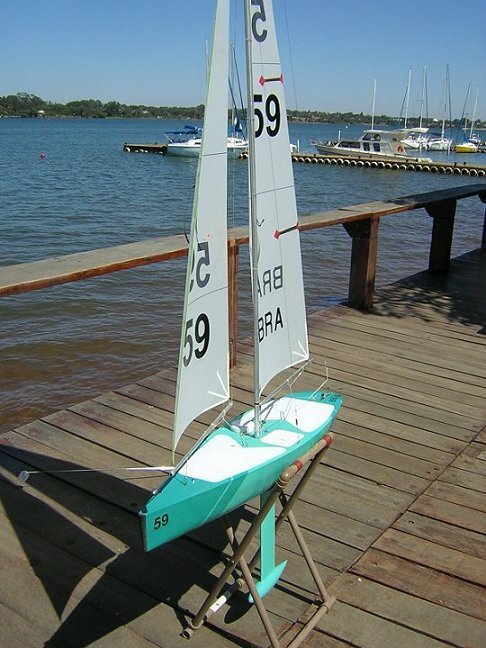 The first time I saw a picture of this sailboat was in a French RC magazine. Since that time, I decided that some day I would buy that boat. The dream came true more than ten years later, while I was living in USA. 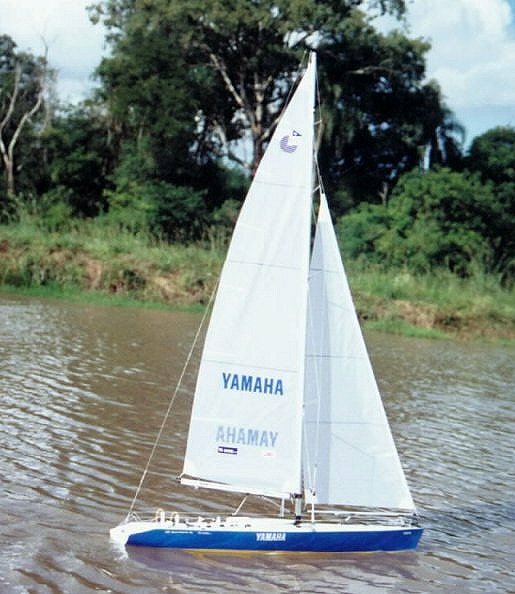 The Tamiya Yamaha Round the World, sold in kit by Tamiya, is a perfect copy in 1:20 scale of the W60 Yamaha, the winner of the 1993/1994 Whitbread Round the World Race. It is 98 cm long and is one of the most detailed models I have ever seen. However, it is necessary to do some changes before you sail the boat. The major one is related to the hatch opening, which is not waterproof (like most of the sailboats produced in kit). If you do not find a way to make your hatch watertight, there will be a real chance of your boat sink. 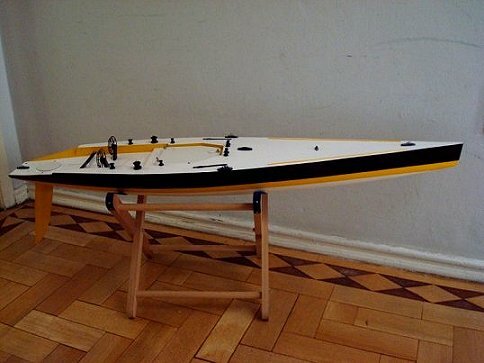 Check the technical section to learn how to modify your boat. Check more about this boat on the reviews section of this site. Currently in assembly. 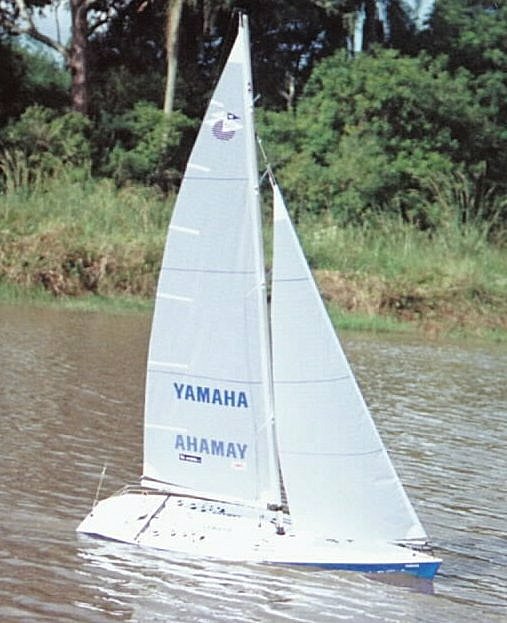 My Seawind has a fiberglass hull, unlike most of the boats of Kyosho's kit, which are made from ABS plastic.